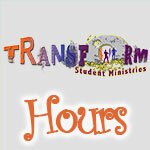 Transform Student Ministries meets on Mt. Zion's Lower Level every Sunday morning, Wednesday evening in the Fellowship Hall and 3rd and 4th Sunday's in the Chapel. Students are taught in individual classes, based on their current grade. Students are currently engaged in our Church Wide Curriculum "Growing on the Faith Journey: Disciplined in the Faith". 9:45 a.m. - 10:40 a.m.